Pumpkin carving is a fun seasonal activity for kids as well as grownups. Unfortunately carved pumpkins go bad fairly quickly and in the pursuit of making their hard work last a bit longer, several bloggers have sought out ways to minimize microbial growth of moisture loss. When searching online, different methods are advocated as being THE WAY to preserve your carved pumpkins. There is however no real consensus on the best method. The experiments used to test the different methods have all had the same obvious flaw. They use different pumpkins to test different methods. Pumpkins with different genetic makeup will theoretically have different resistance to drying and attack from microorganisms. Likewise the environment the pumpkins grew in, will also likely affect their resistance to said factors. In this experiment I tested 6 different methods to preserve a carved pumpkin while trying to minimize the: “no two pumpkins are created equally” problem. Before starting this experiment I had a theory that the optimal treatment would consist of an initial treatment with a disinfectant, followed by an inert barrier of sorts. 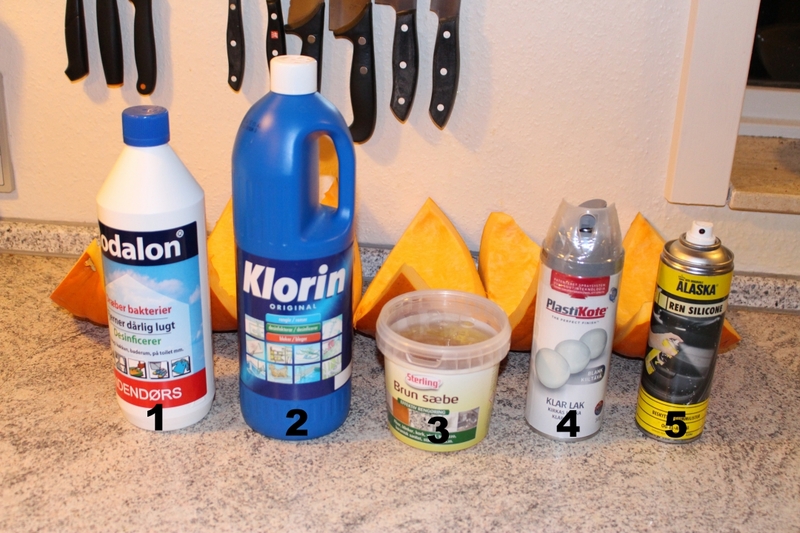 To test this, half of the surface area of the pumpkins treated with rodalon, bleach and soap were all treated with a subsequent layer of silicone spray. To mimic realistic conditions common carving tools were used to process the pumpkin (ice-cream scoop for cleaning out seeds and knife for carving) and no special steps were taken to ensure “sterile” working conditions. All carving was done in a “clean” kitchen environment with tools washed in the dishwasher. The pumpkin pieces were treated one by one and placed outside near an exterior wall of our house, under the overhang of the roof, but far enough out that any rain would find its way to the pumpkins. The pumpkins were then left untouched with no repeat of the initial treatment until a winner could be announced. After 9 days there was a clear winner. The rodalon treated pumpkin had done far better than any of the others and had next to no signs of microbial growth, while all competing treatments had considerable amounts of microbial growth. The closest runner-up was the pumpkin treated with bleach, followed by the silicone treated pumpkin and the untreated (control) pumpkin on a joint third place. Surprisingly the silicone spray had no discernible effect on the pumpkins, regardless if the pumpkins had been treated with disinfectant or not. The soap treated pumpkin did slightly worse than the untreated pumpkin and the clear coat treated pumpkin did worst of all. Truthfully there will probably never be a “gold standard” method for preserving pumpkins. The number of factors influencing the decaying process is staggering. These include, but are not limited to: Type and amount of microorganisms introduced to the pumpkin, tools used to carve and “gut” the pumpkin, temperature, air humidity, precipitation levels, pH levels (in both pumpkin and precipitation), UV levels (uv light kills microorganisms but also degrades bleach) and the pumpkins own resistance to all of the above. Unless we all start using genetically cloned pumpkins, and tightly control the environment in which the pumpkins are grown, transported, carved and later stored for viewing, different similarly performing preservation methods will come out the winner depending on the environmental factors and the particular pumpkin used. However under the conditions this pumpkin was tested, Rodalon clearly yielded the best results in preserving our carved pumpkin. Rodalon is a brand name but products containing the same basic ingredients can be found using the US Household products database and searching for either Didecyl dimethyl ammonium chloride or Benzalkonium chloride. Both chemicals are Quaternary ammonium cations and can probably both be used with similar success. Keep in mind when using strong disinfectants like these, that this is to be done with proper personal protective equipment in a well-ventilated area and is always a job for the grownups. Never mix disinfectants, or other chemicals, as the result can be fatal. As an example mixing bleach with an acid will produce Chlorine gas which will kill you fairly efficiently.